WRKY transcription factors play an integral role in plant immune responses. They display extensive and often complex interactions affecting signaling, transcription and chromatin remodeling. The domain shows high affinity for W box elements in gene promoter regions and these elements occur in high frequency near genes involved in effector-triggered immunity. The NBS-LRR-WRKY family of TNL proteins contain C-terminal WRKY domains and confer resistance to pathogens like P. syrinage. Three of these proteins occur in Arabidopsis; AtWRKY52 (RRS1), AtWRKY26, AtWRKY19. Their varied length and composition make BLAST family pairwise searches difficult because of large gapped alignments, variable domains and usage of multiple queries. Despite advances in bioinformatics methods, very little is known about the diversity and prevalence of NBS-LRR-WRKY genes beyond Arabidopsis. Conserved domain searches such as Hmmer are more effective, however, these are limited to known protein sequences. After comparisons across the bioinformatics methods for gene family detection, we found nHmmer, a DNA homology search, to be most effective in identifying NBS-LRR-WRKY genes. This can be attributed to the ability of nHmmer to recover a sum of all alignments not just the best scoring local alignment. We identified 20 potential NBS-LRR-WRKY genes from 12 genomes. 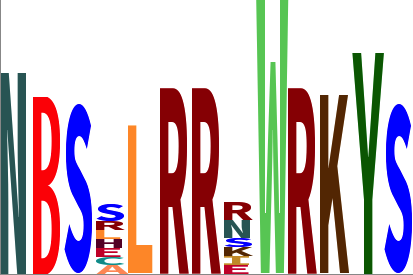 Further analysis suggests NBS-LRR-WRKY genes evolved independently on multiple occasions with predicted proteins containing WRKY domains from Groups I, II, and III. This diversity in origin could explain the varied structures, remote homology and previous difficultly in identification.